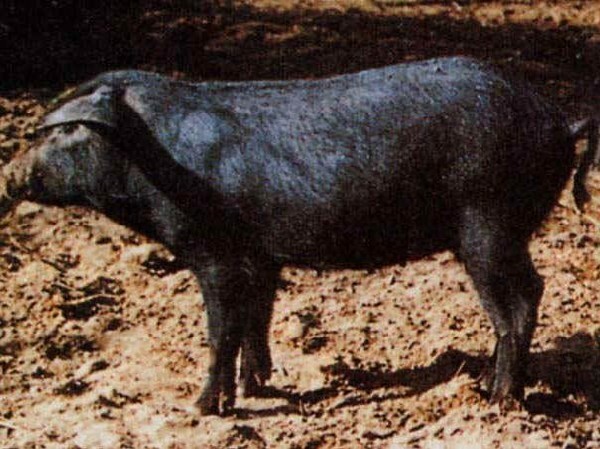 This breed is also called Nebrodi or Madonie black swine. The presence in Sicily of black swine is testified by the references of ancient writers, and verified in the Greek-Carthage period (VII-VI cent. B.C.). It is rustic, almost wild, always grazing in the woods, as fossil remains testify. Today only some limited examples of this breed are reared wild in Madonie and Nebrodi mountains. Precocious and long-lived breed it is characterized by a peculiar fertility and a great number of weaned piglets. This breed is also resistant to diseases and to the inclemency of the weather, being able to appreciate poor food as well. Its meat, either used fresh or to make sausages, gives high quality products. The colour is a uniform black, but sometimes among the pure examples there may be animals bearing a belt like the one present in Cinta Senese. A small-medium size breed, at the end of their production cycle sows reach 130 kg and boars less than 150 kg. This pig has a long muzzle and the long limbs make it a good walker very suited to grazing. The hoofs are hard and resistant.